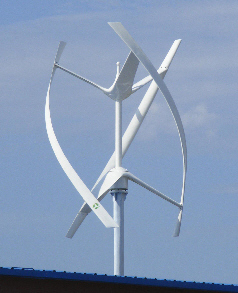 Vertical Axis Wind Turbines (VAWTs) are easily roof mountable and are less affected by turbulent air than Horizontal Axis Wind Turbines (HAWTs), which make VAWTs ideally suited for residential areas. VAWTs rotate at a much lower speed than the high speeds of existing HAWTs (225 rpm versus 900 rpm), resulting in much lower noise levels and vibration. HAWTs, with their ability to generate greater amounts of energy, are often the best match for small and medium-sized municipalities, school systems, farming and industrial estates. Let Midwest Green Energy analyze your needs to determine your best option.